I AM NOT A PROPELLER. I am more than just a giant bronze screw. 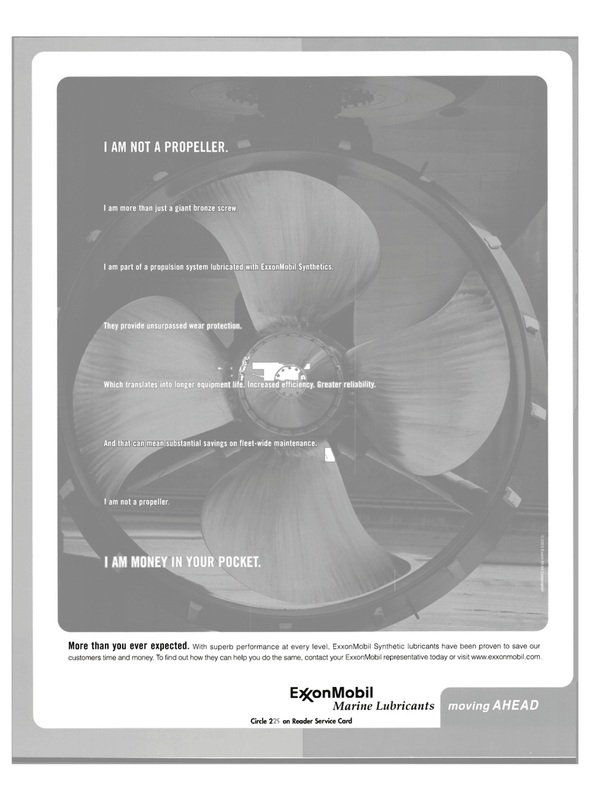 I am part of a propulsion system lubricated with ExxonMobil Synthetics. They provide unsurpassed wear protection. Which translates into longer equipment life. Increased efficiency. Greater reliability. And that can mean substantial savings on fleet-wide maintenance. % am not a propeller. I AM MONEY IN YOUR POCKET. More than you ever expected. With superb performance at every level, ExxonMobil Synthetic lubricants have been proven to save our customers time and money. To find out how they can help you do the same, contact your ExxonMobil representative today or visit www.exxonmobil.com.